It was in a good westerly wind of 20-25 knots that nine competitors of the Azimut Challenge took part in runs this Sunday morning between Groix and Lorient. An exercise for the pleasure that allowed the skippers to embark guests (members of the technical teams, partners, journalists). They had to set the fastest time on a 1.5-mile stretch. The show was at the rendezvous with IMOCA launched at full speed. The long-awaited Charal was talking powder, perched on his huge foils. After a first unsuccessful attempt, the second was the good one. With a time of 4 minutes and 52 seconds, Jérémie Beyou crushed the competition. Samantha Davies on Initiatives-Cœur (5 minutes 31 seconds) and Paul Meilhat aboard SMA (5 minutes 37 seconds) finished 2nd and 3rd respectively. The day after Vincent Riou's victory in the great 24-hour race, the competitors of the 8th Azimut Challenge took part this Sunday in speed runs which made it possible to close the event in a spectacular way. Bringing a record plateau with 15 IMOCA competing, the Azimut Challenge 2018 has kept all its promises. Antoine Mermod, President of the IMOCA class, and Jacques Caraës, race director, take stock of this event rich in lessons. Sailors and organizers were expecting a lot from this 8th edition of the Azimut Challenge. They were not disappointed. Sporting level raised, magnificent technological confrontation, tonic weather conditions, suspense, show, conviviality, sharing: all the ingredients were gathered for a successful event. The sailors of the class were in need of muscular navigations. " Previous IMOCA races have been played in light conditions. Finally we had a breeze! Says Antoine Mermod, President of the IMOCA class. "The wind was rather soft this summer, which did not allow the sailors to test their boats under sustained conditions. 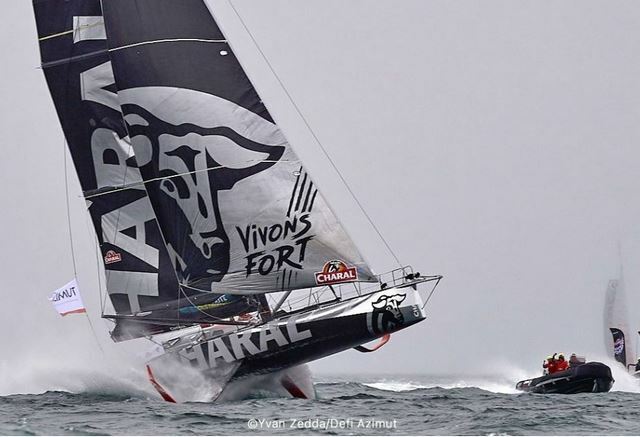 A few weeks from the Route du Rhum, it was important for them to confront each other in the breeze, on a sea formed, "says Jacques Caraës, race director. " At the beginning of November in the Bay of Biscay, there is a good probability of facing this type of conditions. This Azimuth Challenge in the strong wind was a great opportunity to get back into the situation. True challenge, the Challenge has not stolen its name of "test life size". A boat was particularly awaited, the superb Charal of Jérémie Beyou, the first IMOCA new generation. This boat made the show and aroused curiosity. The images, beautiful, speak for themselves. " This IMOCA has impressive potential, the base is extraordinary, " confirms Antoine Mermod. " The boat had to give up the 24-hour race (because of electronic worry, NDR) but it's not so surprising. Such a complex machine requires a lot of development time. " More generally, the challenge Azimut was used to test and compare the different types of foils, to make a technical assessment of the innovations of the moment. Antoine Mermod: «I think we have definitely buried the debate between foilers and non foilers. The Challenge confirmed that foils are the answer. From now on, we enter a new debate between small foils and large foils. We have seen that PRB, with its large appendages, has interesting attitudes at all speeds. The choices made by Vincent Riou and his team seem very positive. " Whether during the race 24 hours or the runs, all the skippers have pushed their machines thoroughly and had fun. Jacques Caraës: «The 24-hour course was both tactical at times and very fast at others. Everyone was able to learn from this experience and learn interesting lessons. I felt that everyone appreciated the confrontation. And all the moments on the ground took place in the conviviality. This is a very important aspect to keep in future editions. The alternating sports and sharing program really holds the road. The race arrives at a certain maturity. Can not wait for next year ! "